Finding the right gaming laptop is tricky. While you always want to invest in one with many exciting upgrades, it is easy to spend too much money on something that doesn't quite perform in the way you want it to. To ease those troubles, there is the Acer Predator Helios 300. This laptop is a fantastic way to play games on the go and gives you every feature or attribute you could ever ask for in a sleek, well-packaged machine. Acer is known for packing its notebooks full of great characteristics, which includes the best gaming hardware around. The Helios 300 follows that trend and provides the user with more power than they could ever need. The Helios 300 is one of the most complete and well-rounded gaming laptops on the market. Before getting into the overarching reasons and key features that give it that title, we first need to look at the specs to break down what exactly it is able to do. As noted, this machine is chock full of gaming power. It comes equipped with a core i7-7700HQ, Nvidia GeForce GTX 1060 6GB, and 16GB DDR4/2400 RAM. You also get a 256GB M.2 SSD and 802.11ac Wi-Fi for fantastic connectivity. There are also ample ports for everything you could ever need. The Helios 300 comes with 2 USB 2.0, 1 USB 3.0, 1 USB 3.1 Type-C, HDMI, an SD card reader, ethernet, a headphone jack, and a lock slot. Customizing your rig with add-ons has never been easier. All of those features create an incredible package that allows you to game to your heart's content, regardless of what you play. Typically, gaming laptops are expensive. Though there is no doubt that the Acer Predator Helios 300 is a significant investment, it offers just as much as more expensive models. Acer does not skimp on specs or try to cut back on quality with their more affordable machines. Rather, you get hardware you'd typically find in bigger-name gaming laptops. Not only that, but you can add onto the storage to get more from the machine. If you want to go that route, you have two options. Acer gives you the choice to upgrade the SSD with a 1TB mechanical hard drive. That will be more than enough to store your games and keep them running smoothly. However, if you don't want to pay for that, you also have the option of opening the empty hard drive bay and installing parts yourself. This is a trickier option, but if you have experience with computers or know how to customize, it is a cheaper way to add on extra space. As you can expect with many gaming notebooks in the cheaper price range, the Acer Predator Helios 300 has quite a bit of plastic within the chassis. However, Acer manages to overcome that by adding in a sleek, brushed-metal lid and a stylish keyboard deck. Those two options go a long way towards giving the machine a much more cohesive and stylish appearance than it would normally have. Another great part of the laptop's aesthetics is the two angled red stripes that shoot along the Predator logo stamped across the lid. That is backed up by the red backlights around the keyboard that perfectly mesh with the slick black keys. You can turn these off when you need to, and they can be dimmed as well. Those subtle touches give the device an extra dimension that makes it so you're not just using any old gaming laptop, you're using something special. There are many laptops out there, and each of them has their own sizes and weights. 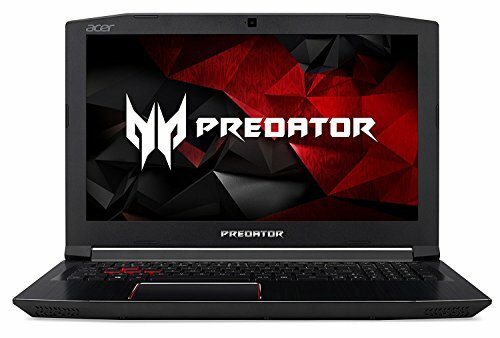 While gaming laptops have a reputation of being a bit heavier than non-gaming ones (because they usually are) the Acer Predator Helios 300 is more compact than most on the market. First, in terms of dimensions, the rig measures 15.4 by 10.5 by 1.1 inches. Those ratios make it much easier to handle and much less unruly that you would imagine. Rather than trying to wrestle with it during use, you can break it out and set it up right away. On top of that, the device clocks in at 5 pounds, 7.9 ounces. That is definitely a good size, but it is not so much that it will weigh you down or hurt your back. Though you will definitely feel the Helios 300 when you add it to your bag, there is no doubt you'll be able to handle it on the go. That is a particularly great feature for people who want to take their system to multiple places. It is also good if you like to shift it around the house. Portability is one of the biggest reasons to get a laptop over a traditional computer. While you can opt to get heavier ones for gaming, it is much better to choose a lighter rig that still has all of the options you want. The next part of this Acer Predator Helios 300 review is how good it feels to use. First, there are the great inputs. The chiclet-style keys will last you a long time and are not too loud. In that way they provide a solid, satisfying clack, but they do so without being too annoying. In addition, the keyboard is incredibly comfortable. This is a feature that many gaming laptops overlook, but being able to rapidly type on the board, use hotkeys, or switch around the screen is a necessary part of many games. It is great to be able to play at your speed without harming your fingers. Of course, as with any good gaming laptop, the Helios 300 is incredibly responsive as well. This is a must-have aspect, and one the laptop excels at. All of your typing movements will register instantly. That is then backed by the extremely reliable touchpad, which also responds right away to provide you with the maximum amount of accuracy. The Acer Predator Helios 300 also has a wonderful display that keeps it looking good regardless of what games you want to run on it. A sharp picture is one of the most important aspects when it comes to a high-quality gaming computer, and that is definitely on display here. The Helios 300 has a 1920x1080 display, which means the crisp picture allows you to view it from multiple angles. It also covers 81 percent of the sRGB color gamut. While there are better displays out there, those specs are more than enough and should make the graphics pop off the screen. Another key feature to pay attention to when searching for a solid gaming laptop is the battery. While most people game at home with outlets easily in reach, you never know when you're going to find yourself on the road or in a tight part of the game without a charger. This Acer model covers such situations with a strong 7 hours of battery life. Though that is much less than traditional high-end laptops, it is far and beyond other gaming notebooks. Playing games take a lot of power, and most gaming machines eat through battery extremely quickly. Acer manages to prevent such issues on two fronts. First, the machine does not come with a G-Sync display. That choice enables it to switch to the integrated graphics of the Intel CPU to save energy when you're not playing a game. Second, the screen is a tad bit dimmer than other models. That allows the device to reallocate some of its energy towards keeping you playing or surfing the web longer. What good is a game without immersion? As exciting good graphics are, sound always helps take them to the next level. In fact, regardless of what you're using your computer for, sound is an essential part to any laptop. Even when you aren't communicating with teammates or putting yourself into a new world, being able to play your favorite tunes is essential for relaxing. Acer knows that, which is why they equipped the Helios 300 with TrueHarmony speakers that play with enough force to fill a room. They allow all parts of a song, including vocals, synth, drums, and bass, to come through with crisp, expert quality. You will also be able to hear all of your favorite games loud and clear. Nothing makes action more exciting than the sounds jumping off of the screen and fully immersing you in the experience. Beyond that, the preinstalled Dolby Audio app offers many different sound-related profiles, including Movie, Game, and Music modes. This helps you make the most of the speakers by adapting to whatever you're listening to. No matter how advanced a gaming laptop is, it's going to run hot. This is a fact of life, and something you need to know up front. However, the Acer Predator Helios 300 does go the extra mile to tune down those aspects and create a much smoother gaming experience. There are two parts to using any gaming laptop; when you're gaming and when you're not. While not gaming the Acer stays quiet and cool under normal workloads. That is important because it means you can use the device in multiple ways and never worry about loud fans disturbing anyone around you. The normal cooling is also important because it enables you to operate with the computer on your lap and not risk burning yourself. While gaming does make things a bit hotter, the machine never gets so hot that you'll be uncomfortable. The cooling does its job here and ensures that the Acer Predator Helios 300 can run some of the more performance-heavy games without overheating or damaging any of the interior pieces. Though some parts of the machine do increase in temperature, the touchpad stays relatively cool. That is a great feature because it protects your hands and adds to the feel. That cooling also comes with softer fans that can work on much larger loads without being too loud or obtrusive. You'll definitely hear them without headphones on, but that is a price to pay with any gaming laptop. Even so, they are much quieter than you would first imagine and largely allow you to game in peace. The Acer Predator Helios 300 continues its impressive list of features with the fantastic PredatorSense app. That handy addition to the device enables you to monitor your CPU and GPU speeds as you go to ensure you never overheat or run too hot. It also helps you fine-tune the fan control for optimal performance. While this model is a gaming laptop, it can also be used for aspects beyond your favorite titles. A laptop is a laptop, and you have full access to the web here. As it comes with Windows 10, the Acer has standard features like Twitter, Sling, and Facebook integrated directly into it. Not everyone will take advantage of those extra options, but they are nice to have for when you want to relax. They also allow you to use the Helios 300 in multiple ways. On top of that, the machine has a two-year warranty that ensures you're making a solid purchase. Rather than worrying about it breaking down, you have a safety blanket should anything go wrong. It is rare to find an affordable gaming laptop with as many features as the Helios 300. This machine is not just another way to play, it is a sleek device that takes your experience to the next level. No matter what games you play, this will be able to run them with flying colors. Add that to the exceptional attributes, low price point, and expert design, and you have the complete package. The Acer Predator Helios 300 is the most complete and well-rounded gaming laptops on the market. It has a wonderful display and a chiclet-style keys that will last for a long time.